Bring security and operations together to protect your organization. Collaborative workflow processes that eliminate friction between security and operations teams sharply lower the risk of data breaches and operational downtime. Enterprises can advance their business agenda by minimizing communications breakdowns that leave the organization vulnerable to cyberattacks. This book shows you how! Explore SecOps Capabilities - Improve vulnerability management, apply shared visibility, and manage compliance across multi-cloud environments. Evaluate tools - Prioritize security vulnerabilities, automate remediation, and achieve scalability. 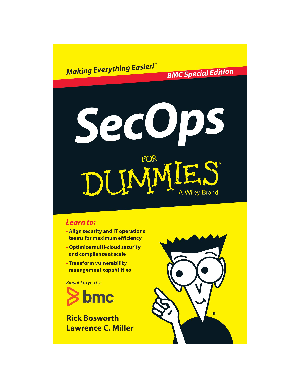 Get started - Create your organization's SecOps vision, assess capabilities, and develop an action plan. Make the transformation - Assemble a team, automate processes, and calculate the return on your SecOps investment.